Global Public Health Vigilance is the first sociological book to investigate recent changes in how global public health authorities imagine and respond to international threats to human health. This book explores a remarkable period of conceptual innovation during which infectious disease, historically the focus of international disease control, was displaced by "international public health emergencies," a concept that brought new responsibilities to public health authorities, helping to shape a new project of global public health security. 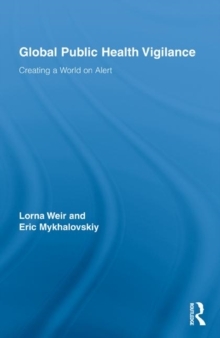 Drawing on research conducted at the World Health Organization, this book analyzes the formation of a new social apparatus, global public health vigilance, for detecting, responding to and containing international public health emergencies. Between 1995 and 2005 a new form of global health surveillance was invented, international communicable disease control was securitized, and international health law was fundamentally revised. This timely volume raises critical questions about the institutional effects of the concept of emerging infectious diseases, the role of the news media in global health surveillance, the impact of changes in international health law on public health reasoning and practice, and the reconstitution of the World Health Organization as a power beyond national sovereignty and global governance. It initiates a new research agenda for social science research on public health.